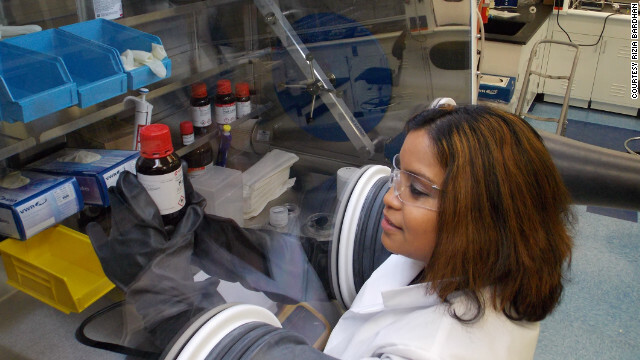 Rizia Bardhan studies nanotechnology at Vanderbilt University. At 29, Rizia Bardhan is already making her mark on one of the scientific community’s most exciting and fastest-growing disciplines: nanotechnology. Researchers in this field are innovating on scales that seem impossibly small: One nanometer is just a fraction of the width of a human hair. Last year Forbes listed Bardhan among its notable “30 Under 30 in Science & Innovation” for her work in nanotechnology. Bardhan accepted an assistant professor position at Vanderbilt University last August. What made you want to get into the field of nanotechnology? When I started graduate school, I really didn’t know anything about nanotechnology –this is back in 2005 –but it seemed very interesting and had a lot of potential. By the time I graduated, I realized that nanotechnology is going to be the future of, not just America, but the world. What do you think the average person doesn’t know about nanotechnology that you think they should? The metal structures I work with are gold– gold nanoparticles. Bar gold is extremely inert; nothing will happen with it. You go down to the nano-level, and look at gold nanoparticle(s), and they are extremely reactive. They can be used as catalysts in a lot of industrial processes. So you're changing the actual properties of these elements when you go to the nano-level, but I think most people would not know that. What type of research with nanotechnology are you currently involved with? The fundamentals of my research program involve designing, synthesizing, (and) fabricating nanostructures that interact with light, and these structures are called “plasmonic nanostructures.” When you shine light on them, they interact with the light, creating very interesting properties. My lab particularly focuses on designing them to be used for biomedical applications. For example, using them in [treating] cancer to both target cancer cells and to destroy the cancer cells. The idea is that you shine light on these structures, they absorb the light and because [the structures] are made of metals, they absorb the light and convert it to heat. The heat is dissipated into the surrounding cancer tissue and this can kill the cancer cells. The particular structures we make in my lab have a dye molecule (in them) and also iron oxide particles on them, so basically what we are making is a multimodal plasmonic nanostructures that can be used for MRI imaging, fluorescence imaging, and also as a form of therapy. So you have the entire spectrum of "theranostic”– that’s the cool word now, meaning it has therapeutic and diagnostic (abilities) - all together. I should mention that the structure that I worked with during graduate school were gold-shell nanostructures or gold nanoshells, and these structures have already been through phase 1 and 2. (They) are, I believe, already in phase 3 FDA trials. I believe these are being tested (to treat) head and neck cancer. We have a U.S. patent on ... multimodal theranostic structures and we’re hoping those will also go through the FDA process at some point. There are many applications for (plasmonic nanostructures). Another is in energy, where we are working on solar cells and photoelectric chemistry. We (use) light-interacting nanostructures to increase the sensitivity of dye-sensitized solar cells. These dye-sensitized solar cells are really becoming a hot topic now because they are cheap. Silicon solar cells are already on the market but, the truth is, silicon solar cells, even though they are very efficient, they are very expensive. If you think about it, for example, a lot of people have solar lights in their garden; if they were $30 apiece, nobody would buy them. Also, after about two months, these solar lights [don’t work anymore]. But if you could make a pack of 8 solar lights for $25, and they last closer to eight months instead of only two, imagine what that new efficiency can do on a larger scale. Using nanotechnology, you are able to increase the life of whatever application you are trying to do for a longer time. The military is really interested in solar cells as well, especially the Air Force because if you’re able to make (solar cells) really small and flexible, you can add the solar cell panels to almost any military plane. They can also be placed on, for example, cameras so if you can create flexible, highly efficient miniaturized solar cells, you can use them instead of a heavy, bulky battery. You’re quite young to be on the cutting edge of a leading scientific field, how did you get on the fast track in nanotechnology? I grew up in India. My dad is an engineer. I come from a family of engineers. So growing up there was a lot of emphasis on getting a good education and getting really good grades and being ambitious. With this ambition, I came (to the U.S.) at the young age of 18 to finish my undergraduate education, not having any family or anybody here. I was quite young, only 22, when I decided to get a Ph.D. So you know I think everything really changed for my career when I decided to go to Rice (University) and study with (Prof. Naomi Halas) and that’s where I met my husband, who is also doing nano research and he was a big inspiration for me. My husband (Cary Pint) is actually now also at Vanderbilt in mechanical engineering. He was also featured on Forbes’ 30 under 30 last year. He’s does nano-energy in batteries. I think it helps us being married–you know, you go to work and you talk about science and you come home and you talk about science (laughs). I’m really here today from the inspiration I get from my husband. He’s been a real pillar to me. Which of the applications for nanotechnology are you most excited about? You know you can use these light-interacting nanostructures in so many areas that I can’t really choose. I’ve always been excited about biomedical applications, so that does maybe end up being my favorite because there’s always going to be a disease, there’s always going to be a need for finding a solution to cure that disease. And I see that nanotechnology can really impact the biomedical direction, not just cancer: There are ways of mitigating Alzheimer’s, there are cardiac diseases, a lot of different things that can be done, so in some ways I do feel like my heart lies in that direction. However, energy is also a big problem right now. If we are able to move away from oil altogether and stop our dependence on Middle Eastern countries you can imagine that that can make a big difference in our economy. That's amazing! I lean towards "Power Generation" through those nano light interactions! I know about Nano-Servo Motion Systems for Motion Control! Nanotechnology is said to be the latest big thing, but I just cant see it. An amazing feat of science. Applications are boundless.